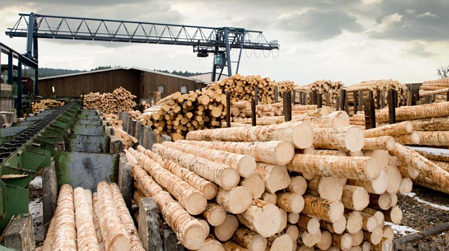 Keeping up with production demands is a proven challenge in the lumber industry. To stay competitive, operations demand higher performance and lower cost for automated equipment. Lumber processing end-users want solutions to the problems encountered in the rough environment of the mills where temperatures fluctuate, dust produced from the processes damages your equipment, and grate machinery. In the past, heavy-duty stainless steel pneumatic cylinders were the only lasting machinery used in lumber production field. In the past years, pneumatic solutions combined with lighter weight and less expensive aluminum have earned popularity and are proving to be very valuable for improving production and outputs, specifically in the sawmills. Mills have previously resisted using aluminum in the past because failure of aluminum pneumatic cylinders was common on equipment, such as high-speed trim saws. This was caused because trim saw applications involved high speed and shock load that they stressed the aluminum units to fill its full potential. This then resulted in more cost due to downtime from the inevitable failure causing sawmill operators to question their use and productivity. Although some may argue aluminum cylinders were less than a quarter of the price of steel the downtime to fix or replace exceeded those savings. This reasoning has changed recently, however, because of a process that reduces wear and tear on pneumatic cylinders. A unique combination of pneumatics, aluminum, and the concept of ideal cushioning increases cylinder longevity and performance and provides sawmills with greater savings, faster productivity and the greater goal more profit. Ideal cushioning helps accelerate lumber cutting by using a combination of lighter cylinders, elimination of excess piston movement and bounce, and quicker cycle times. As well as less wear on the cylinders which reduces the amount of maintenance and cost if needed for replacement parts. Ideal cushioning is a method of slowing down a pneumatic piston as it reaches the end of its stroke inside the cylinder. Basically, there is no end of stroke bounce or end cap slamming, which is a main culprit of cylinder wear, speed, and noise. The piston velocity is at its top speed throughout the entire stroke process. Its velocity is precisely zero by the time it reaches the end cap. Which we do by reducing the piston velocity to zero speed at the end of process, the cylinder experiences less stress. Vibration in the structure is reduced and the total time is improved, sometimes boosting machine speed by as much as thirty percent. Ideal cushioning adjustment is done with a simple screwdriver and allows a free outlet flow adjusted so the piston stops right at the end cap with zero speed. Pistons are then adjusted one at a time with the first one used as a standard to conform to a top speed for a given pressure and cylinder load. Sheffer's Pneumatic aluminum cylinders with ideal cushioning substantially increases speed, lower costs, decrease downtime, reduces noise, and will increase your overall lumber production. Let us help you increase your production speed, increase productivity, shorten your lead times in half and save you and your company money! Read our Blog on our Exclusive Cushion Screw Design Here and contact us for more information.